Top of the Morning readers! St. Patrick's Day is just a few days away. 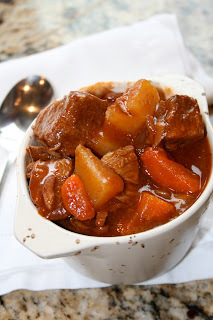 I love a good Irish Stew to celebrate the occasion and my family likes to try new things for special holidays. I came across this recipe at my favorite bakery of all things; so I thought I'd give it a try. It turned out beautifully...and it's de-licious. Place your cubed meat in a bowl and add flour. Mix to coat meat. Like this. You do this so the meat won't stick to the bottom of your pan. Heat olive oil in a skillet and add meat. Stir until meat is browned on all sides. Meanwhile, mix your carrots, onions, onion and garlic until combined. Pour veggies on the bottom of your Crock Pot. Then layer meat on top. Mix 2 cups beef broth and one can tomato paste. Pour over meat in Crock Pot. Measure 1 1/2 cups apple juice. Pour over broth mixture in Crock Pot. Cover Crock Pot and let it cook all day on low (recommended) or 6 hours on high. Mmmm. Look how beautiful it turned out. All of the flavors are infused beautifully. Blarney this smells good! Serve with Irish Bread and a GREEN salad. Heat olive oil in large skillet. Toss beef (or lamb) cubes in flour to coat. Salt and pepper meat generously. Fry meat in hot oil until browned. Place carrots, potatoes, onion and garlic in large slow cooker. Layer browned meat over vegetables. In mixing bowl, combine broth and tomato paste. Pour broth mixture into slow cooker. Pour apple juice into slow cooker. Cook stew on high heat for six hours or on low heat for eight hours. During last hour of cooking, dissolve cornstarch in cold water. Pour cornstarch mixture into slow cooker. Stir to combine. Simmer on high heat until stew thickens. 1 Response to "Irish Stew"